The Canadian north has long been a place of mystery, even to Canadians. With its remote communities, challenging weather, and seemingly endless natural expanses, those of us in the south are both curious and cautious — what we “know” comes from media, from photos, but almost never from our own experience. For this reason, it seems especially important to welcome our northern visitors, especially artists like Reneltta Arluk, who bring plays by and about northerners to Montreal where the show will be staged in English as well as make its French-language premiere. Given that northern communities seem to be in the news the past few years, the show is not only timely, but also showcases a side of northern culture that people do not often see. “We don’t see the relationships between indigenous women and grandparents, and what it’s like to grow up in the bush and move to the city and make decisions. We don’t see TUMIT in any other form. We don’t see the struggle of an indigenous woman balancing her life, struggling and overcoming things, and seeing it on stage,” she says. Even though she’s been living in Vancouver and still runs her company otu of Yellowknife I ask Arluk about the community she comes from. “It’s a 7 1/2 hour drive from Yellowknife,” she says. “Everything is a long ride in the north. It’s hard to be away.” When she first moved to Vancouver she felt out of her comfort zone, but stuck with it because she wanted to keep challenging herself as an artist and a person. She also tells me how many northerners drive to Edmonton to get supplies at Costco and then just drive back north. “There’s none of this ‘in an hour we’re going to get there,'” she says. The play has been very successful. It has travelled from Yellowknife to Edmonton and Vancouver. The Montreal production alternates between the English version and the world premiere of the French language version (translated by Mishka Lavigne), both directed by Montrealer Jessica Abdallah. Another feature is that the cast and crew are half indigenous and half not, making it “very diverse.” Not only is Arluk a northern indigenous woman, but Emilie Monnet, the actress playing Sarah in the French version is indigenous as well. Sound designer Travis Mecredi is Métis. 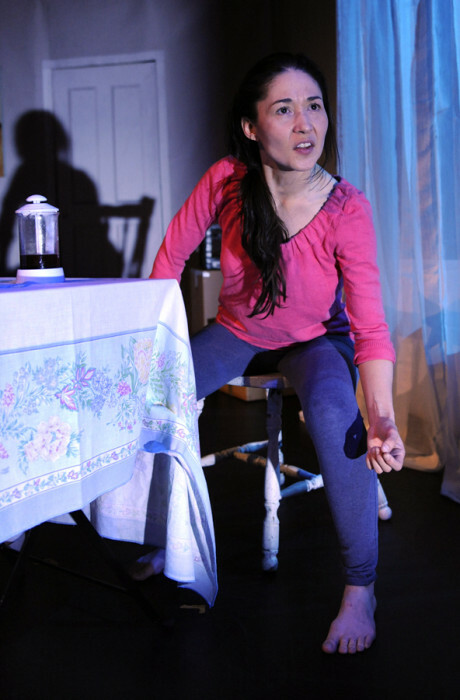 TUMIT plays at the Mainline Theatre starting November 13-21, Tuesdays-Sundays. 8 p.m., with additional 2 p.m. matinees on Saturdays and Sundays. Tickets $20/18.